It's never too late to solve a mystery, or to set the record straight. In the 70 years since the attack on Pearl Harbor, a dramatic photo of female firefighters has been published many times in magazines, history books and online as a depiction of action on Dec. 7, 1941. We published it this past week on msnbc.com. Now, with the help of our readers, we've located one of the women, who says the photo was definitely not taken on that day. The photo as distributed by Getty Images. She's the second from the right in the iconic photo, Katherine Lowe, still living in Hawaii at age 96, where she has great-great-grandchildren and goes bowling twice a week. She can take us back to a time and place that few remember. 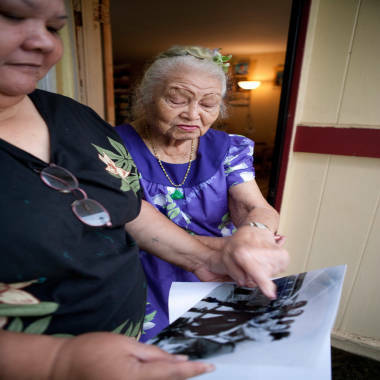 Katherine Lowe, 96, right, looks at the photo of firefighters at Pearl Harbor Naval Shipyard, with her daughter Yvonne Hernandez, at their home, Sunday, Dec. 11, in Laie, Hawaii, on the island of Oahu. Here's a photo of Lowe made at her home on Sunday. Lowe said the wartime photo was certainly not taken on Dec. 7, 1941, the day the Imperial Japanese Navy shocked the United States into joining World War II. On that Sunday morning she was headed to church when the bombing started, and she went ahead anyway because she wasn't sure what else to do. But she and her friends from the Dole pineapple factory did soon go to work as civilian workers at the Pearl Harbor Naval Shipyard, and one of their duties was to fight fires. She said the photo was probably taken at a training exercise during the war. She said she had no idea that her photo was in history books. So the bottom line: These women were female firefighters at Pearl Harbor, the place. To that extent the photo is authentic. But they weren't fighting a fire when this photograph was taken, and they weren't fighting any fires on Dec. 7, the day we remember every year on Pearl Harbor Day. In addition to Lowe's account, there is strong documentary evidence that this is a Navy publicity photo taken to showcase the roles of women during the war. Here's the story of the photo and the female firefighters of Pearl Harbor. "If only we knew more..."
This past Wednesday, on the 70th anniversary of the attack on Pearl Harbor, msnbc.com's PhotoBlog published a selection of historic photos provided by photo agencies. Many readers commented on the photo of the female firefighters, which they had not seen before. The photo came to us from Getty Images with the caption, "Women firefighters direct a hose after the Japanese attack on the US naval base at Pearl Harbor." The photo certainly wasn't new. One can find it online on the History Channel and in several books of war photos, including Fit to Fight: Pearl Harbor Naval Shipyard 1908-2008 published by the Pearl Harbor Naval Shipyard Association with the caption "Following the bombing of Pearl Harbor, female shipyard workers manned fire hoses to extinguish the blazes at the piers." Other examples of books containing the photo are here and here and here, all depicting the photo as if it was taken just after the bombardment. The online successor to LIFE magazine goes further, placing the women fighting the fire "during the Japanese attack." Just days after the 70th anniversary of the attack on Pearl Harbor, a photo mystery has been solved. NBC's Brian Williams reports. "That photo moved me to tears," wrote an msnbc.com reader with the screen name Impatient Girl. "I would love to hear about them." "Put the picture of the women firefighters next to the famous photo of the flag being raised at Iwo Jima," wrote reader JKiff. "The resemblance is amazing. Heroism on all fronts. ... If only we knew more about the women in that photo." Other readers raised questions. They wondered, were female firefighters really working at Pearl Harbor before the war began? Could the photo be a fake, recreated in Photoshop software? "I agree with the few people on here who think the photo of the women is BS," wrote reader Roodles. "It looks nothing like other photos from the attack on Pearl Harbor. No smoke, no fire, no burning battleships in the background, no soot on the women and the photographer had time to get a perfect close-up." On Wednesday evening we republished the photo on our Open Channel investigative blog at msnbc.com, asking readers to help us identify the women and to locate them or their families. One reader, Marieange Dobresk, even speculated that the women must have worked at Jean O'Hara's brothel in the Hotel Street area of Honolulu and hurried over on the morning of the attack to help put out fires. But it didn't take long to track down the real story. One of our readers, James Collins of Washington, D.C., wrote that night to say that, although he didn't know who was in the photo, he knew who would know: Dorothea "Dee" Buckingham, a novelist and former librarian who has written extensively about the lives of women during the war. She had hoped to get a book published, but gave up and started posting her material on a free public blog instead. She's concentrating now on teaching restorative and therapeutic yoga in North Carolina, but still fields questions frequently about Hawaii and the war. Librarians are amazing. It took Buckingham only minutes on Thursday to find the photo in the Hawaii War Records Depository, which includes a collection at the University of Hawaii of more than 2,000 photos taken by the Honolulu daily newspapers, the U.S. Army Signal Corps and the U.S. Navy between 1941 and 1946. Here's the link to this photo in the war depository. Here's a higher-quality scan of that photo from the library's print. It's clearly the same photo, apparently made from an image closer to the original negative, because you can see detail in more areas of the photo. A scan made last week of a Navy print of the undated photo. And there were names! The caption: "A crew of women fire fighters, all crews having been chosen from personnel working in the immediate vicinity of the pumper stations. From left to right: Elizabeth Moku, Alice Cho, Katherine Lowe, and Hilda Van Gieson." As we browsed through the online photo collection, we saw there was a second photo of these same women. The caption identifies other women in the foreground (Mary Ornellas, Minnie Cooke, Dolores Himenes, Elizabeth Raymond), and in the background our familiar four, from left, Lowe, Van Gieson, Cho, and seated holding the nozzle, Moku. The next photo in the university archive, also from the Navy, shows the same women, in the back center. It appears to have been taken on the same day, doesn't it? The women are dressed the same, clearly posing in groups with fire hoses shooting out streams of water, as sailors and others watch casually from a distance, relaxing by their bicycles and cars. But what happened to the women? Might any of them still be alive? One of the public records services that we subscribe to, Accurint, includes an address for a Katherine Lowe in Hawaii, born in August 1915, which would have made her 26 at the time of the Pearl Harbor attack. The public records gave her address in Laie, about an hour's drive from Honolulu, and gave us a cell phone number that turned out to belong to her daughter, Yvonne Hernandez. We e-mailed the daughter a copy of the photo. "Yes, that's my mother! And my Auntie Moku!" Hernandez said, referring to Elizabeth Moku, the woman at the nozzle of the fire hose. "I am overwhelmed. My mother never mentioned any of this to me. She's shocked." She put her mother on the phone and we talked a while about the war. In 1941, Katherine Lowe and Elizabeth Moku were best friends, both already married with children, and working together at the Dole pineapple factory in Honolulu. "I was a trimmer," Katherine said. "It was hard work." On the morning of Dec. 7, "We were ready to go to church. We didn't know we were at war. We went to church anyway. We were looking at all the planes bombing." Lowe remembered the nights of fear that followed. "There was a blackout. We couldn't go nowhere. No more lights. We had to blacken up our house." With the nation at war, she applied for one of the new civilian jobs at the Pearl Harbor Naval Shipyard, in a storage facility. For fun the women played volleyball and basketball. Another photo in the archive shows Elizabeth Moku with an undefeated basketball team. "We were rugged," Lowe said. "We carried heavy stuff, oil drums, bags, anything that needed to be stored." Fires in the storage areas were common, and could be devastating, so "they trained us for firefighting." She said she recalled at least one time when they put their skills to use at an actual fire, but she remembers it mostly for the recreation it provided. "It was a lot of fun. We'd shoot water at one another." Lowe said she had no memory of anyone taking a photograph, but she can tell from the two photos that they're not at a fire, probably a training exercise at the Pearl Harbor shipyard. Lowe lost a young son during the war years. While she was at work at the shipyard, and her 3-year-old Joseph Kauhi was at a babysitter's, another child kicked him in the stomach. They didn't know what had happened until it was too late, and he died during surgery. The women stayed friends after the war. Katherine Lowe's children called Elizabeth by the name "Auntie Moku." Moku retired as a Navy commissary cashier, and died in 1986. Lowe went on to work as a clerk in a Navy office at Pearl Harbor, moved to Okinawa with her second husband to work for the U.S. Army, and then moved back to Pearl Harbor before retiring. She had eight children altogether (her second husband died 41 years ago), and has six children surviving now, with too many grandchildren and great-grandchildren and great-great-grandchildren to count. She lives with her daughter and a great-grandson. She walks with a cane, and has to take her blood-pressure medicine, but she's up at 4 a.m. to hitch a ride to breakfast with friends and then twice a week to her bowling league. She said her bowling average is "145, going down," and she's rolling a smaller ball these days, just 10 pounds. When our photographer visited, she had flowers in her hair and volunteered to do a bit of a traditional hula dance. Katherine Lowe, of Hawaiian and Chinese ancestry, demonstrates a traditional hula dance at her home on Oahu. Lowe said she doesn't know what happened to the other women in the photo, Alice Cho and Hilda Van Gieson. Many of our readers speculated about the ancestry of the women, noting the variety of ethnicities represented in the photograph. Katherine Lowe is native Hawaiian (Polynesian) and Chinese. Her friend Elizabeth Moku was native Hawaiian and German. Judging from surnames, Cho might be Chinese or Korean, and Van Gieson might be Dutch. In any case, a typical Hawaiian potluck. As for Cho and Van Gieson, women of the same name are listed in the Social Security Administration's public records of Americans who have died and for whom survivors collected a death benefit. The list is indelicately called the Death Master File. We can't be certain, but the listings are for women from Hawaii and of approximately the right age. Hilda Van Gieson, born June 12, 1915, would have been 26 at the time of the bombing. Died in 1990. Alice Cho, born June 6, 1923, would have been 18. Died 1987. Alice K. Cho, born May 28, 1913, would have been 28. Died 1999. Or maybe it's neither. The Cho and Van Gieson in the photo might not be the same women listed in death records. Getty Images lists this photo as having been taken by a stringer, or freelance photographer. It's included in Getty's Hulton Archive. Edward George Hulton Archives owned Picture Post, the popular British photo magazine, whose photo archives were eventually bought by Getty. A vice president at Getty in London, Matthew Butson, said its archives have a negative of the photo, what's called a "copy negative" made from a print. The caption in the Getty archives takes the emotion to a new high, perhaps a fantasy from a Picture Post editor: "On that fateful December 7th, 1941, these girls of Pearl Harbor helped extinguish the flames that were raging at the naval base. They were the first women defense workers of America." Soviet propaganda poster: "Women workers! Take up the rifle!" Another note of history: The researcher Dee Buckingham points out that there were firefighters from the Honolulu Fire Department at Hickam Field on the morning of Dec. 7. All were men. Three died when a Japanese bomb fell on them. Here's her blog post about their deaths and compensation for their widows. And there were women serving in the military at Pearl Harbor at the time of the attack, including nurses. The chief nurse, Annie G. Fox, received the Purple Heart (which at that stage of World War II could be awarded for merit or bravery without wounds) and then received a Bronze Star. And we'll end with this, anticipating some of the comments: No, Joe Rosenthal's famous photo of the flag on Iwo Jima was not staged, though the photo was taken when a second, larger flag was raised on the island's Mount Suribachi. You can, as they say, look it up. U.S. Marines of the 28th Regiment of the Fifth Division and a Navy corpsman raise the American flag atop Mt. Suribachi, Iwo Jima, on Feb. 23, 1945.